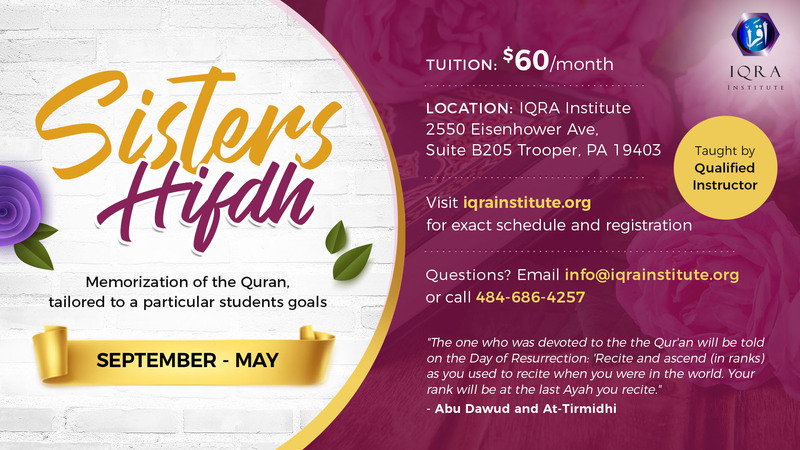 Our Sisters Hifdh program is aimed at dedicated students of the Holy Qur’aan, who are intending to start memorization or build upon their existing memorization of the Holy Qur’aan. Students should be comfortable in reading the Quran, and understand the rules of Tajweed. During this program, students will learn how to memorize effectively whilst retaining and revising previous Surahs, while revisiting the Rules of Tajweed as needed. Increase memorization of the Holy Quran, tailored for you. Develop your memorisation skills and learn efficient ways on how to retain and expand your memory. earn various techniques on how to memorise the Qur’aan and the best one that works for you. Weekly live classes conducted by the teacher. iOS or Andriod device (IQRA Institute endorsed Quran app to be installed). This course requires the student to be able to read the Qu’ran fluently with Tajweed. You will be given an initial assessment to establish your level, and will be put on a memorization program schedule to follow. This course is runs yearly from September to May, with summers off. The classes are conducted in person on Mondays from 7:00 PM – 8:00 PM. Tuition is $60/month. Taught by Sr Gehan Taha. Please register below to enroll.